Are you tired of tangled necklaces and the never-ending struggle of digging through the mound to find a matching earring? 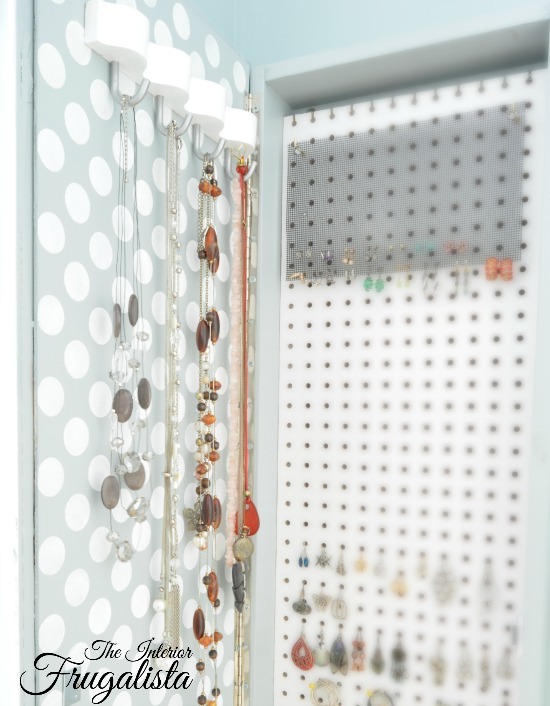 Here's an idea for corraling ALL your jewelry in one place where everything is organized, tangle free, and easy to find. The bonus, it's hidden behind an inexpensive floor length mirror. 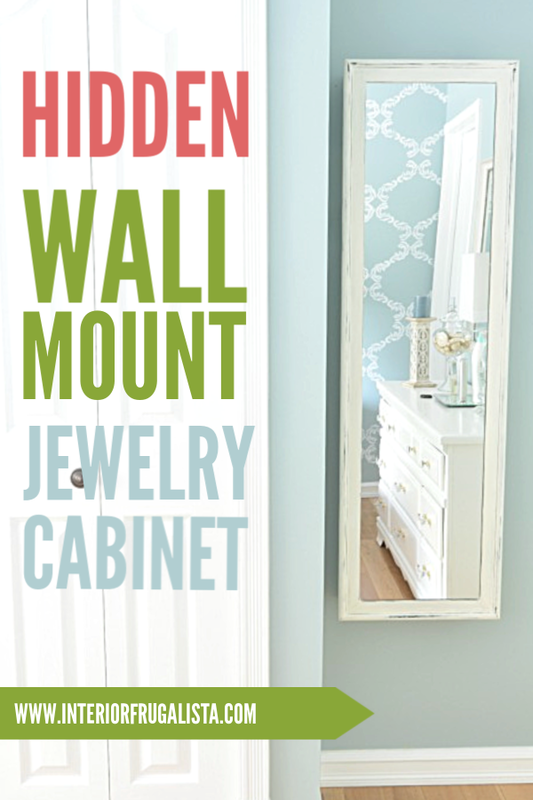 Here I'll be showing you how easy it is to make a hidden wall mount jewelry cabinet. 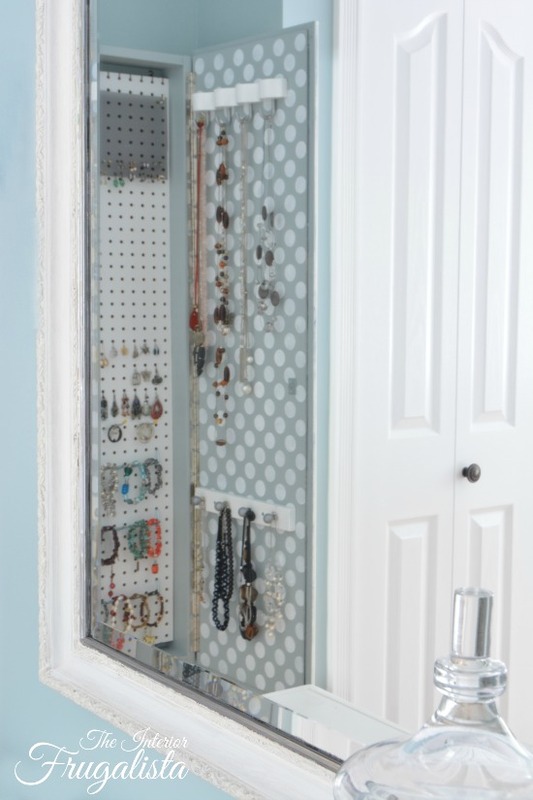 The cabinet can be built to recess into a wall between two studs, like a bathroom medicine cabinet, for a flush mount installation or hung onto the wall like we did. 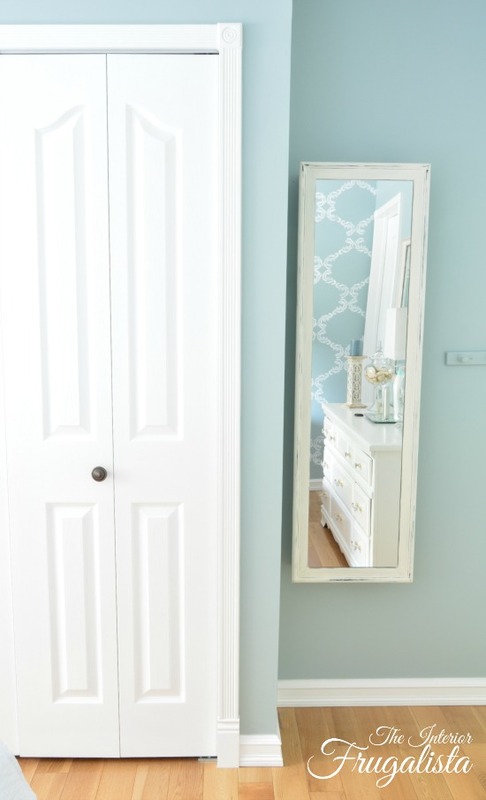 The inspiration began when we purchased an inexpensive floor length mirror at Wal-Mart with the intention of painting it white and hanging it in the master bedroom. We bought it to replace the one that was previously hanging in the room but re-purposed into a DIY Antiqued Mirror for our dining room. 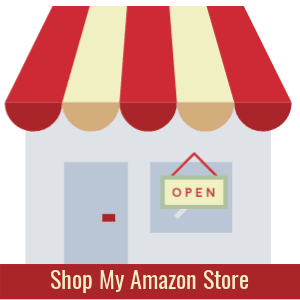 I've included affiliate links in this post so you can see what products I used or recommend to build this project. See my disclosure policy. I painted the frame with a 50:50 ratio of old white and pure white chalk paint. I distressed a little around the edges with sandpaper and gave it a coat of clear wax to protect the finish. 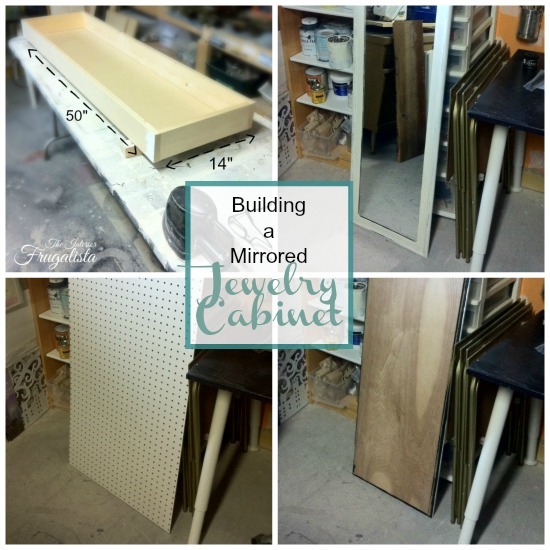 Using 1" x 3" lumber build a simple rectangular frame (14" x 50") slightly smaller than the mirror (15 1/2" x 51"). Attach them with #8 2-inch screws in each corner and use wood filler to conceal the screw heads. If you want to get fancy and have them hidden you could use a Kreg Pocket Hole Jig but in our case, it wasn't important because they would be hidden. Cut a piece of plywood to fit the back of the frame and secure in place using a nail gun. Cut a piece of plywood to fit the back of the mirror. Secure it to the back of the mirror with mirror adhesive and clamp until cured. We placed a sheet of 1-inch plywood on top to hold them in place while they set overnight. We painted the cabinet in Wedgewood Gray (HC-146) same color as our bedroom walls. Cut two strips of 1" x 1" lumber to fit the inside of the cabinet and using wood glue and a nail gun secure them in place (pictured above). 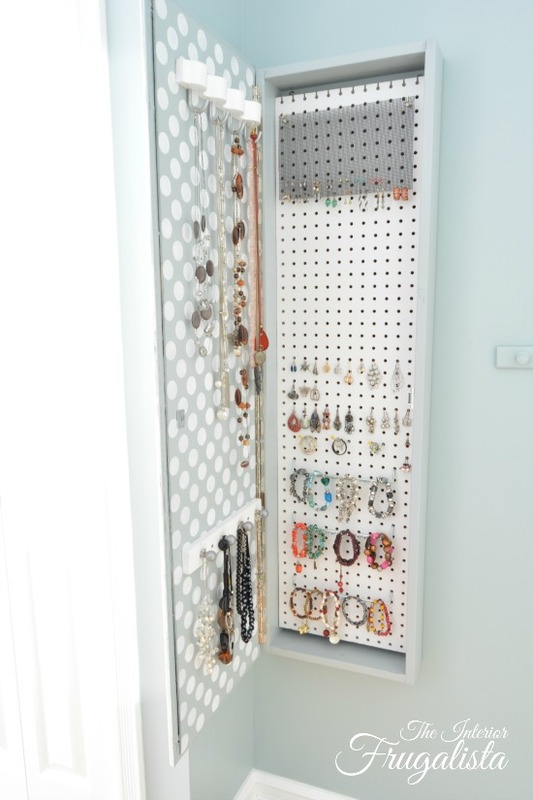 Attach white pegboard onto the 1" x 1" strips using a nail gun. 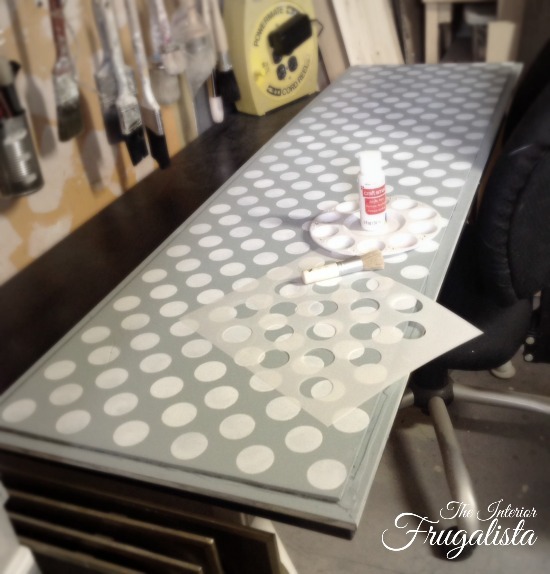 To add a fun element when you open the door, I stenciled white polka dots on the back of the door. 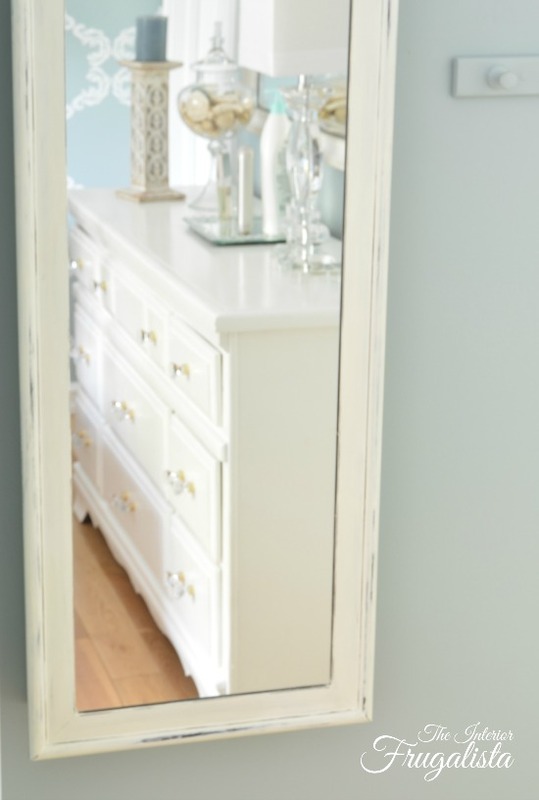 Cut a metal piano hinge the length of the door and mount it both onto the cabinet and the door using #8 1/2-inch screws. Make sure the screws you use are not too long that they break the mirror on the opposite side. Attach a magnetic door latch according to package directions. 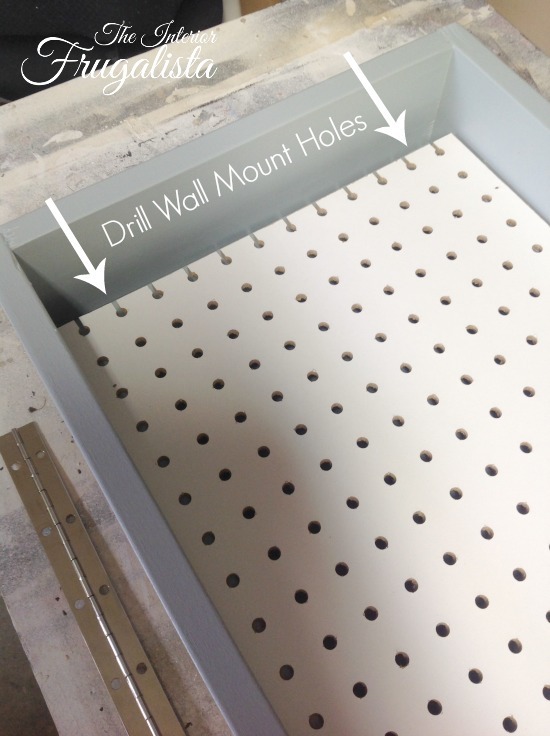 Drill pilot holes through the back of the frame in each corner top and bottom. This is where they will be secured to the wall. Here is where you'll need a second set of hands. Have someone hold the cabinet up to the wall where you want it mounted. Place a level on the top of the cabinet to ensure it is nice and straight. Using an Awl poke a hole into the wall through your pilot holes in all four corners. Where your holes are on the wall (as pictured below) attach drywall anchors if you were not lucky enough to hit a stud. 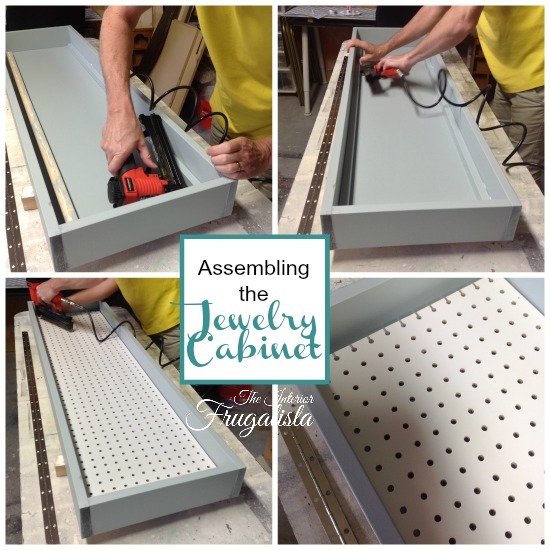 Place the screws into the pilot holes in the cabinet and screw them in until they stick out the back of the cabinet slightly. 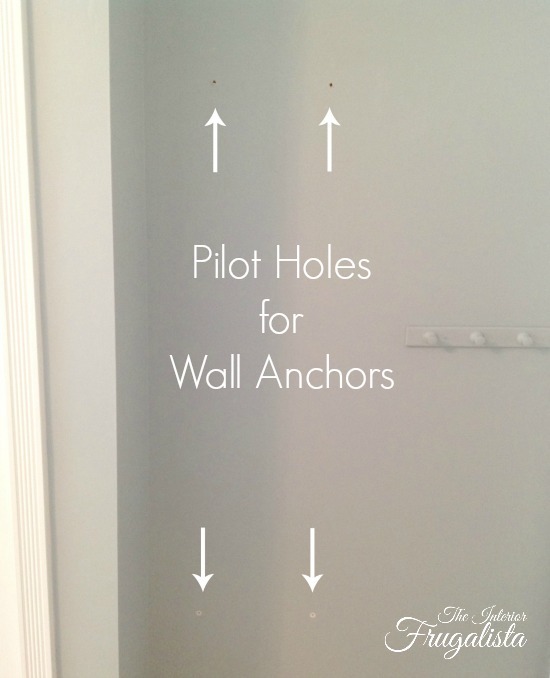 This will make it much easier to see and feel your way to lining them up to the anchors on the wall. 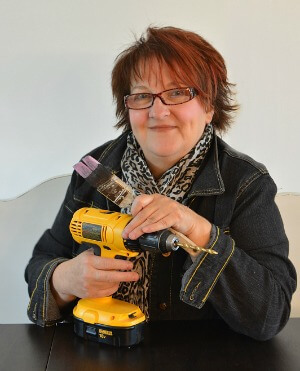 Line up the screws to your wall anchors and tighten the screw completely. 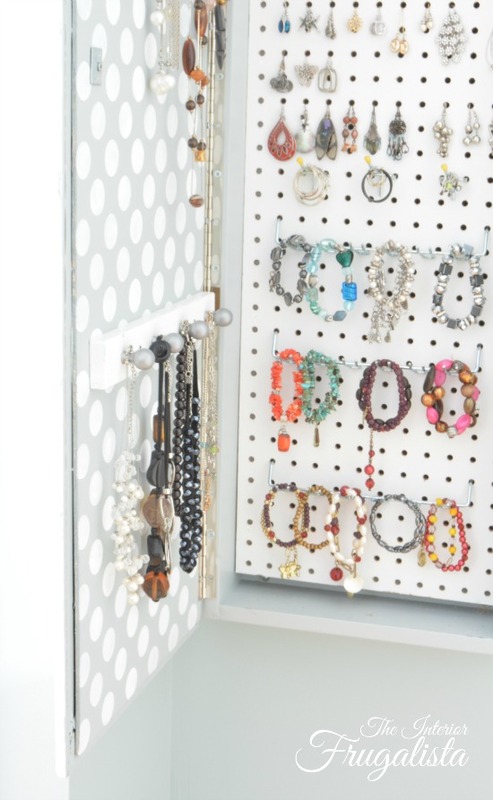 Now for the fun part, adding pegboard accessories to organize your jewelry. 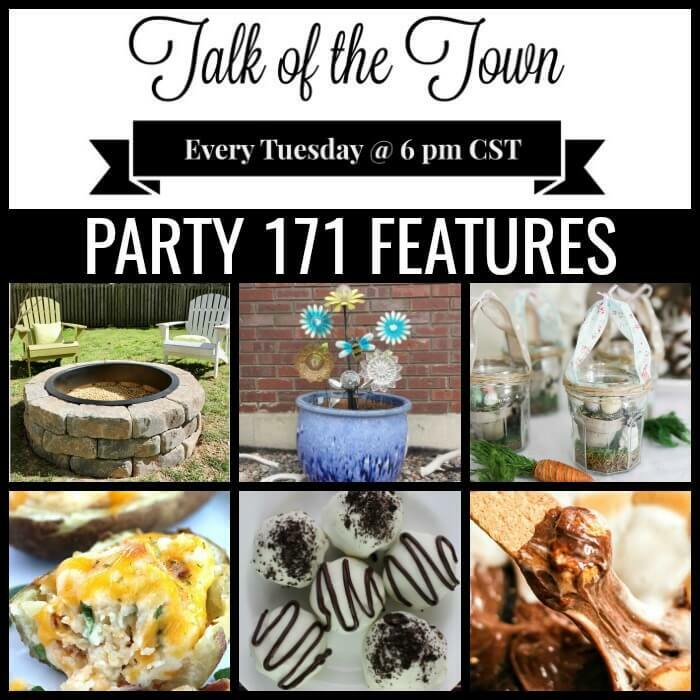 In the materials list, I've included a link to the many options that are available. Our kids used to have these IKEA organizers in their rooms growing up, I keep everything. 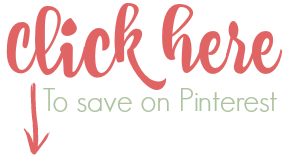 They were perfect to use for necklace hangers on the back of the door. Secure them in place using #8 1/2-inch screws. I had a basket full of pegboard hooks that I used to use in the workshop. 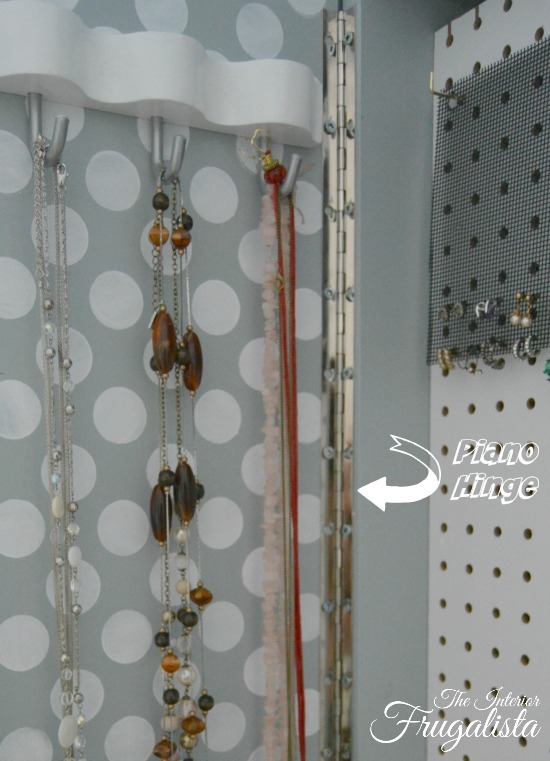 They are perfect for hanging bracelets and hoop earrings. 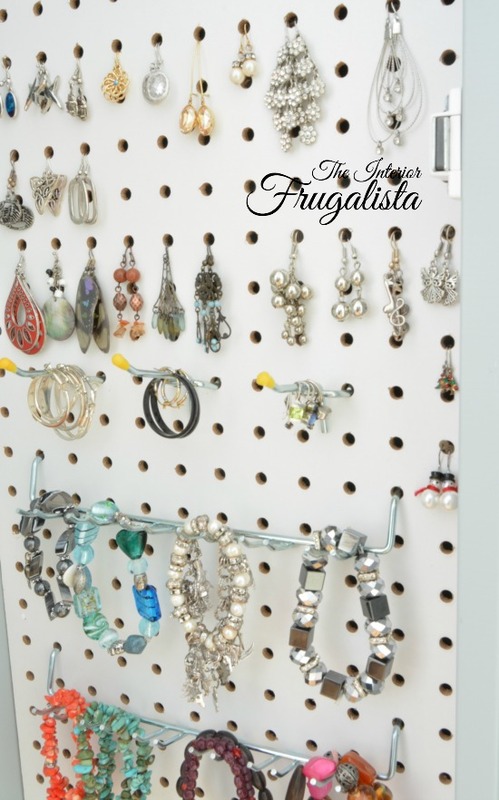 Each hole in the pegboard fits a pair of wire back earrings. Initially, we cut slots into the top row of the pegboard holes for post style earrings (see photo above). That was a fail because the pegboard is too thick and they ended up falling off. Onto Plan B, using plastic coated wire mesh. 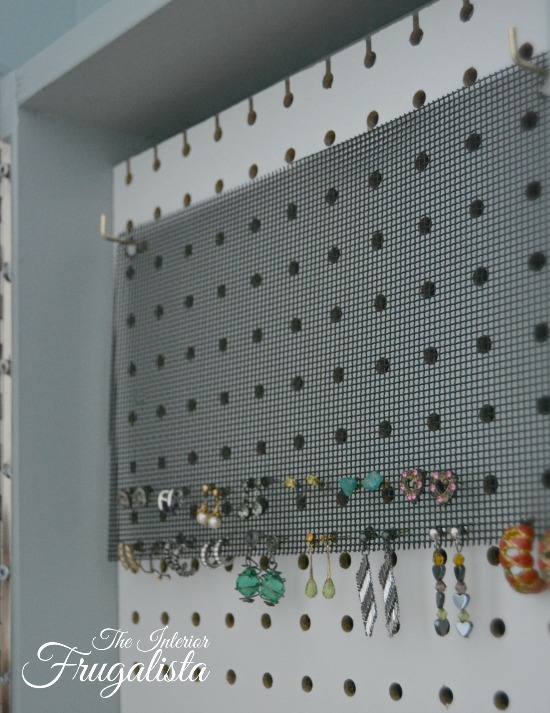 We installed two cup hooks into the pegboard and hung a small piece of wire mesh. The mesh can be easily removed to hook post earrings on and off and it works like a charm. There is loads of room to add to my earring collection. Perhaps some diamond earrings would look fabulous hanging in here, just saying Mr. Frugalista. Another bonus, because they are inside a cabinet, no more having to wipe the dust off of my necklaces because they hung from a hook behind the bedroom door.